Well….. at least for a while. We have one or two more coming but this is it for a few weeks. Colors are Plum, Stone, Light Taupe. 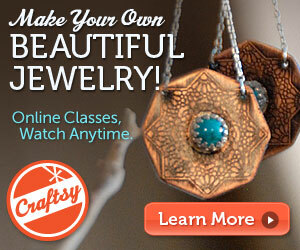 A new class on Craftsy. This is from Margie Deeb and is about Jewelry Design for Bead Artists. I love her books. I think she has a good design foundation and the way she describes design principles with various examples to learn by works for me. This class from Crafsy is for beginners. It contains several hours of high definition video lessons which you can access at any time so you can go over and over sections – making sure you get the picture! AND you can pose questions to Margie in the virtual classroom. So I’m back from the Bead & Button show in Milwaukee, WI. Each year I find the whole experience utterly intense. It’s hard for me to go to sleep at night I’m so wired each day. Nancy Cain is a great teacher. Willing to answer questions, full of useful tips and techniques. Oh boy, I learned many new things and can’t wait to start implementing these ideas. The title doesn’t really describe what we learned – we learned to engineer anything we want! But of course, you have to focus to start with so vessels it is. Here’s the official description – Engineering Vessels. Two friends from my old Tampa beading group were there and we sat together at one of the round tables, along with another woman who was confident enough to feel comfortable with three people who already knew each other. Everyone began work on a project – some I could already see the finished item. Mine will come together eventually, just not during the class. Too many calculations required. Plus, I wanted my own stash near at hand. Peyote was the first stitch I learned, and is probably the first stitch most people learn. If you want to, you can get seriously in depth. Which is what happens when you spent your time focusing on a particular technique. Meet the Teachers was fun. The 3 of us worked the table, drank a little wine, talked to acquaintances we hadn’t seen for a while, and wandered around looking at other people’s tables. And of course, the Marketplace was a huge draw. I bought several tubes of beads, some Swarovski rivolis, and picked up the Toho challenge kit for 2015. I have plenty to keep me busy until next year’s show……..